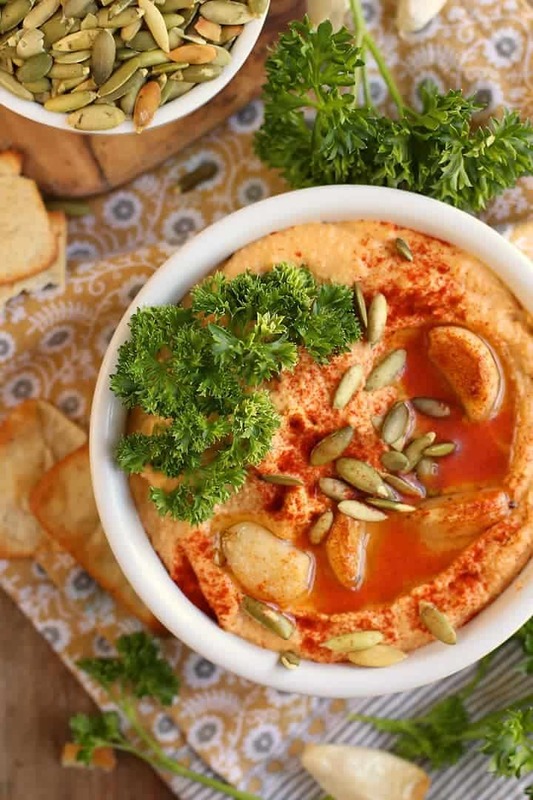 Make your hummus at home with this seasonal smoky Roasted Garlic Pumpkin Hummus. Serve this healthy and delicious gluten-free snack with carrots, crackers, and pita chips. To roast the garlic, preheat the oven to 400 degrees F. Cut the top off of a garlic bulb so that the tops of the garlic cloves are exposed. Drizzle a couple of teaspoons of olive oil over the exposed cloves, wrap in tin foil, and bake for about 30 minutes until garlic is tender and fragrant. Remove from oven and let cool for 10 minutes before pulling the cloves out of there skin. In a food processor combine chickpeas, pumpkin puree, tahini, 2 tablespoons olive oil, lemon juice, roasted garlic, reserved chickpea liquid, cumin, and salt. Blend until very smooth, scraping down the sides as needed. Transfer to a serving dish and top with pumpkin seeds, fresh parsley, and a sprinkle of paprika. Serve with crackers, pita, or vegetables. Store in an airtight container in the refrigerator for up to 5 days.